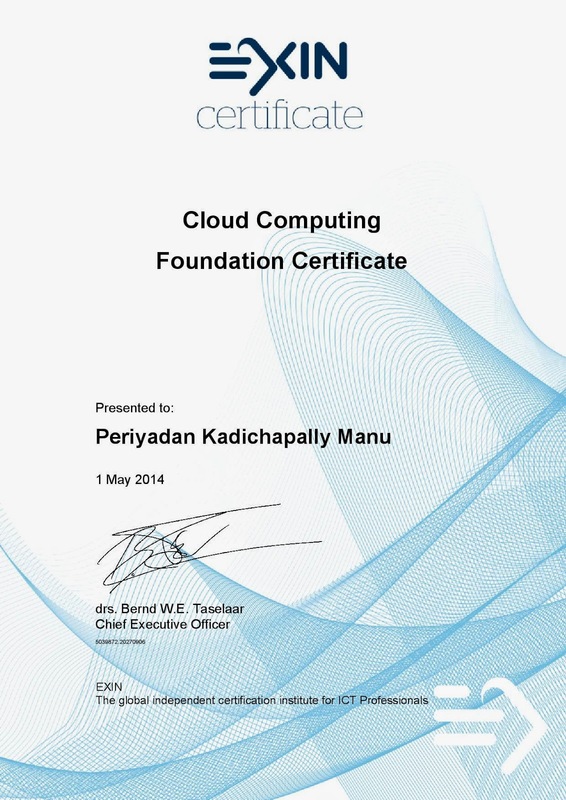 Recently I have attended a workshop on EXIN Cloud Computing Foundation course and cleared the certification exam. This post is bit about topics covered in the exam and my experience learning those topics. The principles of Cloud Computing. This chapter deals with definitions, types of clouds (Public, Private and Hybrid) and cloud services (IAAS, PAAS, SAAS). Most contents in the section are from the The NIST Definition of Cloud Computing paper. Other topics include The Evolution Toward Cloud Computing, Cloud Computing Architectures and Benefits and Limitations of Cloud Computing. The part about Virtualization and its role in the raise of Could computing was quite interesting for me. Using the Cloud. This part is about accessing the cloud and mobility in the cloud. This module covers the topics Overview of Accessing the Cloud, How Cloud Computing Can Support Business Processes and Service Providers Using the Cloud. This module covers the paper Top Threats to Cloud Computing prepared by the Cloud Security Alliance under the Security Risks and Mitigating Measures title. Managing Identity and Privacy section deals with Triple-A authentication and various aspects of identity management. This module includes the topics Building a Local Cloud Environment and Managing Cloud Services. There is a lot of focus on managing cloud services and related governance frameworks. This module speaks about the business case for cloud computing. For example cost implications to an organization evaluating the cloud services in terms of capex and opex. Forming the Service level requirements and agreements. The text in italics are taken from the official exam page. SchemeServe provides connectivity to sureties, agents, contractors and obligees for surety bond processing. It enables a full coverage of business intelligence needs of an insurance company.